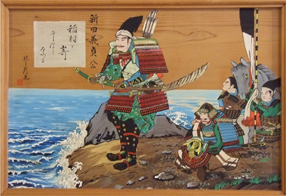 During the Nanboku-cho period, there was a brave and great samurai warrior named Nitta Yoshioki. He was the second son of Nitta Yoshisada. During that time, Japan was divided into North and South and they had repeatedly battled. Nitta Yoshioki fought for the Imperial Southern Court and became famous for being a strong warlord who could win against any kind of large army with his wisdom and bravery. However, he was killed by the enemies through a cowardly attack at the "Yaguchi Ferry." Enemies bored holes in the bottom of Nitta Yoshioki and his retainers' boat and fired off arrows from both banks. (Died on October 10, 1358) The Samurai warriors who engaged in Nitta Yoshioki's killing, was cursed by Yoshiaki's haunt and went crazy and died or saw ghost like fire balls, and lighting hit the place many times. Villagers witnessed these horrific events and decided to build a shrine for Nitta Yoshioki at the site of his death in order for his spirit to rest in peace. 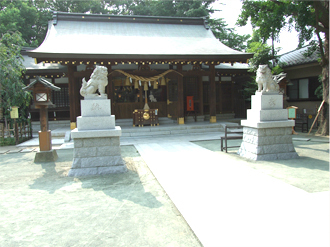 Nitta Shrine is a shrine based on "Goryo Shinko” which is a Japanese belief. Japanese people viewed natural disasters that threatened people and great plagues as the work of evil spirits. Since the power of the spirits is enormously strong, people thought that the evil spirits could adversely save the people from accidents or disasters by enshrining them as a god. The belief was widely spread throughout Japan. Nitta shrine commemorated the 650th anniversary of its construction in October 2008. The shrine is now well known as the "Good Luck Shrine" and is reverenced by Japanese. Copyright © Nitta Shrine. all rights reserved.